The storm was not letting up. Our pilot was not coming for us. And if Mark and I didn’t make our way out of the glaciered wilderness, up and over the passes of the Chilcats, through the bear-infested rainforest and down to the ocean we were going to die. Or at least get fired. The Chilcat Range. Photo by Paul Shea. 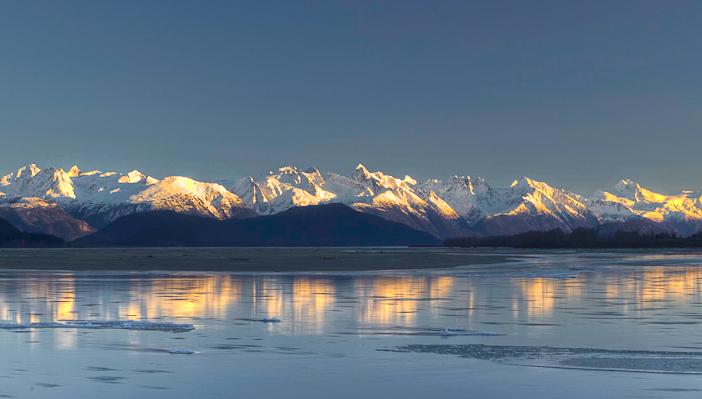 Ten days earlier, we’d chartered a plane in Haines for a romantic four-day vacation. We’d planned to ski pow, couloirs and peaks, eat fat and check out a few base camps in Glacier Bay National Park with roller duffles and day packs. A few days in this spot, a few days in that spot; ski plane, car camping. OR Athletes Mark Allen and Sheldon Kerr hitch a ride to the Chilcat Mountains in Southeast Alaska via the Alaskan Marine Highway. “The poor man’s cruise,” to some of the best skiing in the world. Photo by Mark Allen. Now, we were separated from Haines by twenty-plus miles, five glaciers, thirty avalanche paths, five creeks and one big river. We had one tortilla, one Tasty Bite, one packet of oatmeal and one can of tuna for what we hoped would be two twelve-hour days. We meticulously plotted our escape plan with our maps and compasses, and entered a dozen points into our GPS units. We packed camp into that silly roller duffle, stood it upright, took a waypoint, tied in, and skied away into the whiteout. Sheldon Kerr taking pure olive oil to the dome. This oil is what the two used to sustain themselves during a 2.5 day, 20+ mile overland traverse back to Haines after being without food for three days. This was much looked forward to after hours of alder and devils club while making their way down the bear-infested river valley. Photo by Mark Allen. Twelve hours and 300 calories later, having strained our eyes in 30-foot visibility, dodged cliff bands and schussed passed ice falls, we made our way to the riverbed. The air was thick with oxygen, greenery, and something else…what was that smell? Bear signs. Everywhere. Scratch marks, warm poop, open dens, little tracks, big tracks, giant tracks. We’d traded highland dangers for lowland dangers, with which we were much, much less comfortable. We positioned ourselves to sleep that night based on how we wanted to be eaten. I decided to sleep with my head at the door of the tent so that I would die quickly if attacked. Mark decided to sleep with his feet at the door, risking a slower death for a chance to fight. Our slumber was interrupted a number of times by long, low, moaning growls. We’d sit straight up, hearts pounding, grabbing for one another’s hands only to hear the sound emit from Mark’s undernourished belly. His stomach was not happy on the past week’s 500-calories-a-day ration. We drifted back off to sleep until my belly woke us in terror an hour or so later. The second morning of our escape began with a shared oatmeal packet and ended with a can of tuna. We snowsaw-macheted through miles of devils club, tromped over yards of brush alder, sloshed through mud three feet deep. The epic-requisite emotional breakdown came around 3 p.m. when I collapsed into a pile of my thorn-laden softshell self. Too worked to cry, I pleaded for calories. “If we don’t eat that tuna right now…” “We can’t eat the tuna. I’m not carrying a smelly tuna can around.” “If you don’t open that can, I will kill you. Do you want to die by bear or by girlfriend?” We ate the tuna. With the very last of our stoke, we made it to the west bank of the Chilcat River. The one remaining bar of sat phone battery power summoned our valiant friend Eric Forster, who met us with a canoe, two snickers bars and a huge smile. “How was plan B, dudes? !” Epic. Sheldon Kerr is a professional skier, climber, mountain guide and Outdoor Research athlete with a P.O. Box in Silverton, Colorado. Her career has brought her and her clients to the tallest peaks on three continents, a dozen different countries and hundreds of mountaintops. She logs at least 250 days a year in rock climbing shoes, on skis or in crampons. 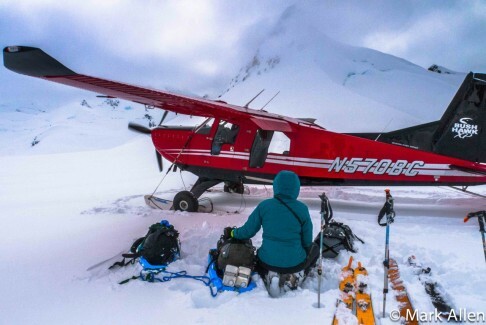 On her personal time, Sheldon grabbed first descents on remote islands above the arctic circle, raised $35,000 for the American Breast Cancer Foundation through an all-female climb of Denali, completed harrowing ski traverses in remote southeast Alaska and watched hundreds of hours of Food Network programming. 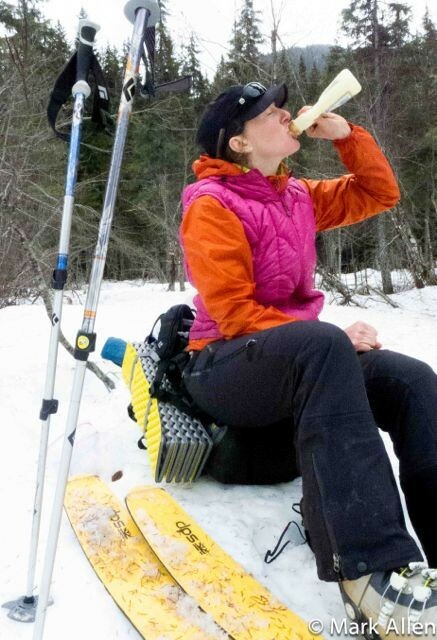 She is also an EMT and a freeskier, and no, that irony is not lost on her. 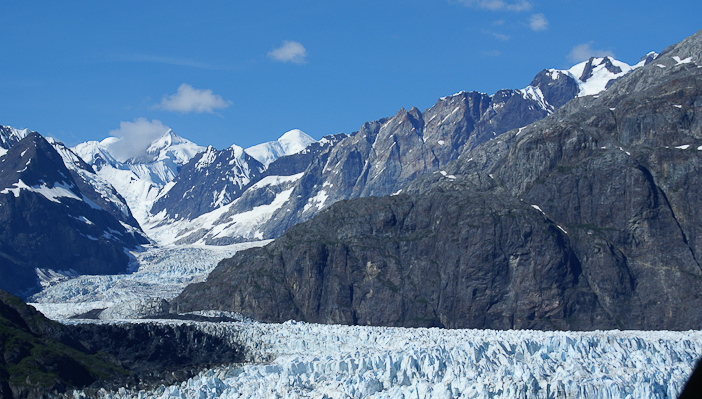 Glacier Bay National Park. Photo by Randy Roach.